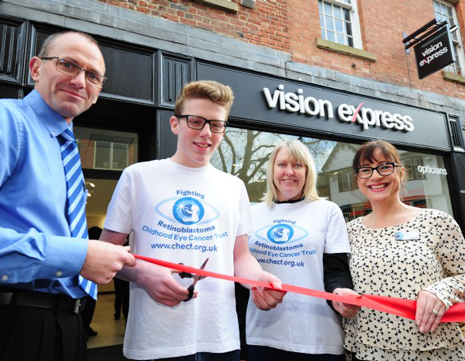 Vision Express has officially opened its new Chesterfield store with a local eye cancer survivor, who is a budding Olympian, cutting the ribbon. Thomas Greig from Chesterfield joined the Vision Express team, led by store partners Katie Thorpe and Craig Farquhar, to unveil the new premises on Packer's Row - the opening of which brings together two store teams who have been trading within Chesterfield from separate locations - Vicar Lane Shopping Centre and Low Pavement - for a combined period of 25 years. 13-year-old Thomas and his family are ambassadors for the Childhood Eye Cancer Trust (CHECT), a nominated charity of Vision Express. In January 2002, Thomas was diagnosed with retinoblastoma and has since undergone chemotherapy and had his eye removed. Not allowing his condition to hold him back, Thomas is a proficient swimmer and is currently training for the 2020 Olympics. Katie Thorpe, store partner, said, "It was fantastic to have Thomas and Judy take time out to come and help us unveil our new store, as they're as passionate about eye health as we are. In addition, the way Thomas is quite literally making waves on the Olympic track made him an incredible inspiration to have in-store on the day. "Since opening our doors, we've been rushed off our feet and we're delighted at the feedback we've received. Thanks to new facilities and equipment, we can provide a thorough and individual vision care service to the local community, with a wealth of experience under one roof." Last year Vision Express employees and customers raised over £160,000 for CHECT.